Your short-notice transatlantic flight (for love) or a checkmate! There are two reasons why you would be ready to take a transatlantic flight in the next two minutes - If there's a love waiting on the other side or if there's a checkmate!!! So, we give you the second reason to take the flight in our chess class today - hosted by Chess Queen Alexandra Kosteniuk from the World's No. 1 www.chesskillertips.com. Enjoy. 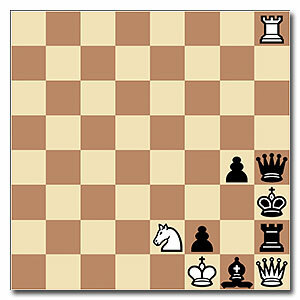 White plays and mates in two moves. Chess Problem published in Musical World, 1860. Very cool - love your daily chess class podcasts. Makes my evening tea.